TORONTO -- The Hockey Hall of Fame Class of 2014 was a celebration of greatness at the NHL and international levels, and the Class of 2015 could have a similar sentiment. For the first 44 years of the Hall of Fame, the list of enshrined members was almost exclusively North American-trained players. 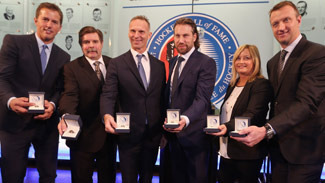 Vladisav Tretiak went into the Hall in 1989, and Borje Salming followed in 1996 to help start the flow of European-trained players into the sport's museum of excellence. The Class of 2014, with Rob Blake, Peter Forsberg, Dominik Hasek and Mike Modano, was the first to have players from four different countries, and the first to have three players not from Canada. The Class of 2015 is almost certain to have two more European-trained players, and three is a possibility. If there was a special VIP level at the Hockey Hall of Fame, Lidstrom would be in it. He is simply one of the greatest defensemen in the history of the sport. Lidstrom is one of three players, along with Bobby Orr and Doug Harvey, to win the Norris Trophy seven times. He is a four-time Stanley Cup champion and the first European-trained player to win the Norris and Conn Smythe trophies. Lidstrom was a 10-time First Team NHL All-Star, he was the Norris runner-up three times and finished second in the Lady Byng Trophy voting five times. He is a member of the Triple Gold Club, winning gold at the 1991 IIHF World Championship and the 2006 Turin Olympics. He will be the fourth member of the Hall of Fame from Sweden, joining Salming, Forsberg and Mats Sundin. A longtime teammate of Lidstrom's, Fedorov is one of the best two-way centers in NHL history. He is a two-time Selke Trophy winner and the 1994 Hart Trophy winner as League MVP. Fedorov had 483 goals and 1,179 points in 1,248 games, all of which are NHL records for Russian players (though Alex Ovechkin could catch him in goals before the 2015 induction ceremony). Fedorov was a trailblazer, defecting from the Soviet Union after winning gold at the World Junior Championship and twice at the World Championship, helping the Russians win both tournaments in 1989. He later won a third gold at the worlds in 2008. Like Lidstrom, Fedorov was a great ambassador for his country in the sport and will be the sixth Russian-trained player in the Hall, joining Tretiak, Valeri Kharlamov, Slava Fetisov, Igor Larionov and Pavel Bure. He was hockey's rock star in his youth and an icon near the end of his NHL career, revered by young countrymen Ovechkin, Alexander Semin and Semyon Varlamov and other teammates alike in the Washington Capitals dressing room. While Lidstrom and Scott Niedermayer became the model for the modern defenseman, Pronger retained the mean, tough, physical play of some of the elite defensemen in the 1970s and 1980s. He won the Hart Trophy and the Norris Trophy in 2000, and finished in the top five of the Norris voting in five other seasons. A member of the Triple Gold Club, Pronger won the Stanley Cup in 2007 with the Anaheim Ducks and helped carry the seventh-seeded Philadelphia Flyers to the 2010 Stanley Cup Final. He is a two-time Olympic gold medalist (2002 and 2010) and helped Canada win the World Championship in 1997. Though his career has been cut short by injury and he spent nearly all of it in an era that depressed offense, Pronger is still among the top-30 defensemen in goals and points in NHL history. Ruggiero's resume is impeccable, and her place in the Great Hall on Front Street is a matter of when, not if. She is the all-time leader in games played for the United States national team, men's or women's. She is a four-time Olympic medalist, winning gold in 1998. She has won the World Championship four times and finished second on six other occasions. Ruggiero is in the United States Hockey Hall of Fame and IIHF Hall of Fame. This is her first year to be eligible, and it might be all she needs. Ruggiero, or another women's player, would be exempt from the committee's limit of four men's players. Bure, Fedorov and Alexander Mogilny were a great line for the Soviet Union, but the KLM line is one of the most revered in the sport's history. Larionov is already in the Hall, and Makarov has a strong case to join him. He spent only a small portion of his career in the NHL, but he won two Olympic gold medals and eight golds at the World Championship. Makarov had 134 goals and 384 points in 424 NHL games, but 456 goals and 1,094 points in 943 games between the NHL and the top Russian league. If there was any doubt about his ability against world-class players, Makarov had 16 goals and 31 points in 22 Canada Cup games, helping the Soviets win in 1981 and finish second in 1987. Could he, or one of a couple players coming up on this list, join Fedorov in the first Hall of Fame class to feature two Russian players? Iain Fyffe wrote a great chapter in Rob Vollman's 2014 Hockey Abstract where he used standards set by current members of the Hockey Hall of Fame (broken down by era so as to not compare a current candidate to pre-expansion or pre-World War II players) to create the Inductinator, a formula for determining the worthiness of future players' inclusion in the Hall. Kariya has the highest score of any forward currently eligible, higher than Fedorov and much higher than the rest of the players below him on this list. Kariya had 402 goals and 989 points in 989 games despite the beginning and prime of his career being in a scoring-depressed era. He was a three-time First Team All-Star, a two-time Lady Byng Trophy winner and won gold medals at the Olympics (2002) and World Championship (1994). Modano said during his induction weekend that had Zubov played in a different market, he'd be considered on a level similar to Lidstrom. Zubov might be one of the most underrated players in NHL history, and has one of the best resumes of any player who has already been eligible despite rarely being recognized for his greatness while playing. Zubov has 152 goals and 771 points in 1,068 games. That is six fewer points than Blake, but Zubov played in 202 fewer games. It is 16 points less than Salming, who played in 80 more games and in a more offensive era. Zubov won the Stanley Cup twice, but was never a First Team All-Star and was never higher than third in the Norris Trophy voting. He scores poorly in Fyffe's formula because he wasn't recognized for individual awards. If the emphasis on puck possession in the present NHL was around in Zubov's era, more people would compare him to Lidstrom. Bure is in the Hall of Fame. Fedorov is certain to join him. What about the third member of the most famous amateur line of the past 25 years? Among players with at least 700 games, the only ones not in the Hockey Hall of Fame who averaged more points per game than Mogilny are Eric Lindros and Bernie Nicholls. Mogilny had 473 goals and 1,032 points in 990 games. He earned a spot in the Triple Gold Club after winning gold at the 1988 Calgary Olympics, the 1989 World Championship (not to mention a world juniors gold in the same year) and the 2000 Stanley Cup. Lindros averaged 1.14 points per game, but only played in 760 of them because of injuries. That is 14th all-time among players with 700 games. His case is helped by the inclusion of Bure and Cam Neely, players who similarly dominated during a short career. Lindros won the Hart Trophy and the Art Ross Trophy in 1995, but that was his only season in the top five in points. He never won the Stanley Cup, but had 57 points in 53 playoff games. Like Mogilny, he had a fantastic amateur career and did win a gold medal at the 2002 Salt Lake City Olympics. A debate about Recchi vs. Lindros is all about someone's take on the Hall of Fame. Lindros was dominant for a short period of time; Recchi compiled 1,533 points in more than two decades. He is 12th all-time in points. Of the top 27 scorers in NHL history, Recchi is the only one who has been eligible for the Hall who is not in yet. He won the Stanley Cup with three different teams, but finished in the top 10 of Hart Trophy voting only twice and never in the top five. Osgood is 10th all-time with 401 victories, and the rest of the top 11 are in the Hall. No one from No. 12 to 18 is, though, and several are his contemporaries. Osgood did win the Stanley Cup with the Detroit Red Wings three times, though once was as the backup. He finished in the top 10 of the Vezina Trophy voting three times, but the top six only once. Andreychuk compiled a lot of goals, 640 of them to be exact. He's 14th all-time, and every member of the top 30 is either in the Hall or somewhere between a lock (Teemu Selanne, Jaromir Jagr and Jarome Iginla) to very likely (Recchi). He has almost no international resume, and won the Stanley Cup as a role player in his final season. He never finished in the top 20 in Hart Trophy voting, and despite his goal total never finished higher than fourth in any one season. One of three Americans to score at least 500 goals, Roenick had 513 and 1,216 points in 1,363 career NHL games. He helped the Chicago Blackhawks to the Stanley Cup Final in 1992 and won a silver medal with the United States at the 2002 Salt Lake City Olympics.